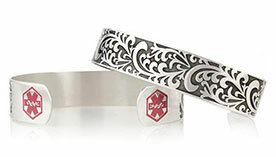 Wearing custom-engraved medical ID jewelry really can save a life! My medical ID saved my life! In some circumstances your airway and your voice can be affected. I have just such a case. If my trigger is strong enough it can affect my ability to speak as well as breathe. I own four Lauren's Hope bracelets. I am never not wearing one. On more than one occasion, my ID bracelet has saved my life. Without my information someone may have not known what to do for me. My Lauren's Hope bracelet saved my life two years ago when I had a life threatening event. I was told that the inscription "No blind NG" changed the trauma team's course of treatment. Thanks again for sharing! My Lauren's Hope bracelet saved my life. So I would wear anything from Lauren's Hope. Thanks to Lauren's hope for all the beautiful lifesavers. 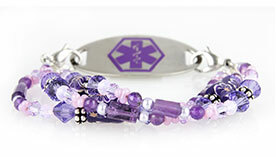 Does your Lauren's Hope medical ID bracelet have a story to tell? I have Diabetes, and I have some medical allergies (Latex and Penicillin). If I touch, smell, or or come in contact with either of these, I will die. It is so severe. 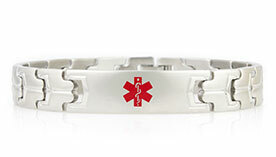 I have been having medical issues with passing out, and wearing this bracelet has saved me when I am out and an ambulance has to come take me to the hospital. Thank you, you have saved my life more than once. When I was in a major car accident 5 years ago, my medical I.D. bracelet saved my life because of all my medical issues. I don't go anywhere without it and have it on 24/7. I wear my bracelet every day. I am asthmatic and allergic to duoneb treatments. It has saved my life more than once when the fire departments arrive. It also lets the ER doc know that I have spasmodic dysphonia which is a abnormal spasm of the vocal cords. Thank goodness for these beautiful bracelets. Your bracelets/necklaces have saved my life more than a few times now, and I love that when I wear your items, I don't feel "branded" as ill, but can be safe as well as stylish! Thanks for the great products and excellent service... kudos to you! My Lauren’s Hope bracelet has saved my life before during an asthma attack, and I wouldn't dream of being without it. People compliment me all the time on my bracelet, and I love to give them the website! 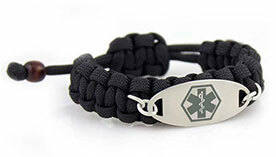 It's so nice to share that there ARE cool medical bracelets out there. I am 23, and having options is so refreshing! Your bracelet was seen and noted by paramedics at my motor vehicle accident. This alerted them to my allergies and my health status. I initially was not able to speak for myself, and your bracelet saved my life. Fashion with purpose.